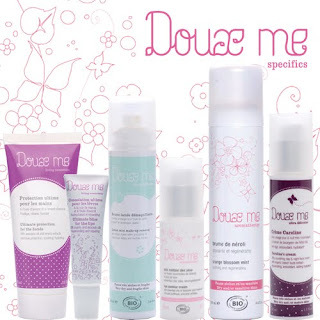 Here at LoveLula.com we are welcoming the Doux Me range with open arms and we can’t wait for you to try them too! Now we all know that French women are amongst the most beautiful in the world and OK, I’m not actually French but this little range has certainly made me feel gorgeous! I just had to let you know how much I am LOVING this elegant, sophisticated and delightful range of products! These little French Fancies are practically overflowing with good-for-you organic ingredients and therapeutic properties to optimise your skins health, wellbeing and of course, your natural beauty! Made without using any water or alcohol and instead using organically certified floral waters, fruit waters and essential oils, each product contains an exceptionally high percentage of organic ingredients and the exclusive use of organically certified active vegetal ingredients, extracted in a proper and ecological way. I’m absolutely hooked on the Lotion Mist Make-up Remover. Simply mist the face and then gently wipe away to reveal perfectly cleansed and radiant skin. I then follow this with the Cult Classic “Carolines Cream” which is a Day & Night Anti-Aging Moisturiser which boosts the metabolism of my skin, smoothing out any out fine lines and wrinkles along the way! This really perks up my dehydrated skin but for combination skins I’m also recommending the Balancing Day & Night Face Cream as an absolute must! My other absolute Star Product has to be the Eye contour cream with Lavender and Chamomile (which is a great value size at 30ml!) and since I have been using it my dark circles are practically nowhere to be seen! So, my skin is feeling great and I’m loving the range but sometimes I need a little extra boost which is when I reach for the Doux Me Face Mask and Gentle Exfoliator. This 2-in-1 product not only gives great value for money and refines and renews the skins surface but also moisturises and deeply comforts the skin too. Being one that has tried many a beauty product I am really loving my new beauty regime of Doae Me 'rose glacée' smoothing milk cleanser, lotion mist make-up remover and Creme Caroline Day & Night face cream.